If you are Fluffy Windover, kindly ignore this post. I mean it, Fluff- spoiler ALERT!!! Zander mander is home sick today, which is sad to see his little sick face all sick and sad, yet nice, as I am stuck home doing much needed laundry. And blog posting! And dish washing! Wheeee! What stinks about the housebound day is that I was supposed to go over to Fluffy’s to see her new baby. 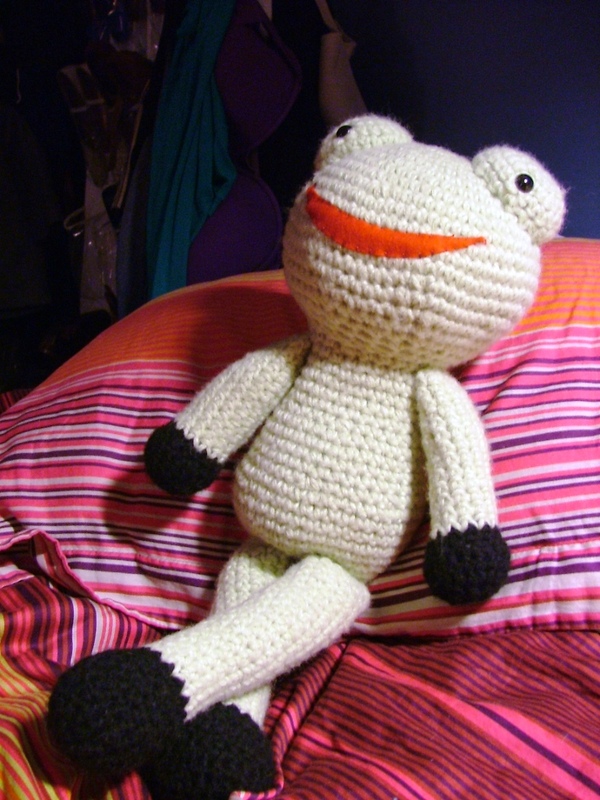 I have presents for said baby, including the awesomest amigurumi friend I have ever made. In my life. For reals. 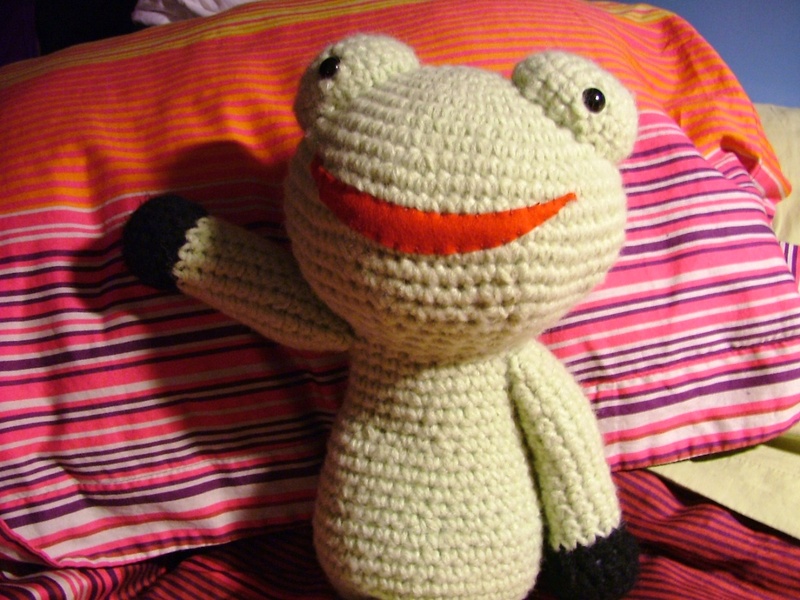 This guy is based on a photo from one of my amigurumi books, and it might be very close to the actual pattern, although I couldn’t be bothered with actually following the pattern to the letter. I just can’t be bothered. Bothering gets you nowhere with me, patterns. 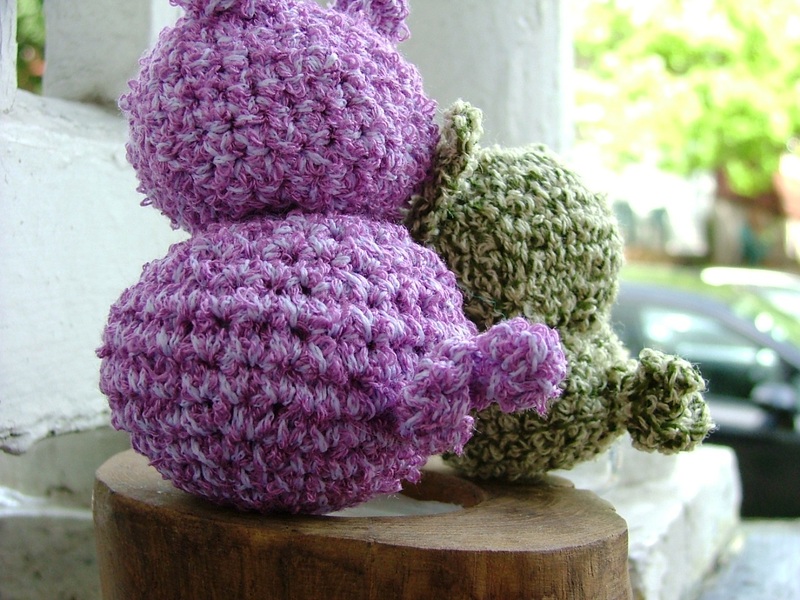 Now, I did bother myself recently with another amigurumi pattern, one that I did write down, and test, and made into a kit! Have a look at the little guys, and let me know what you think. I’ve got them at Lovelyarns for sure, and I’m debating whether or not I should sell them in my etsy shop. Thoughts? This entry was posted on September 22, 2008 at 12:08 pm and is filed under musings. You can follow any responses to this entry through the RSS 2.0 feed. Both comments and pings are currently closed. the cuuuuuuuuuuuuuutest little frog friend i’ve ever seen!! i love how you set him up and had him wave…to ME!!! 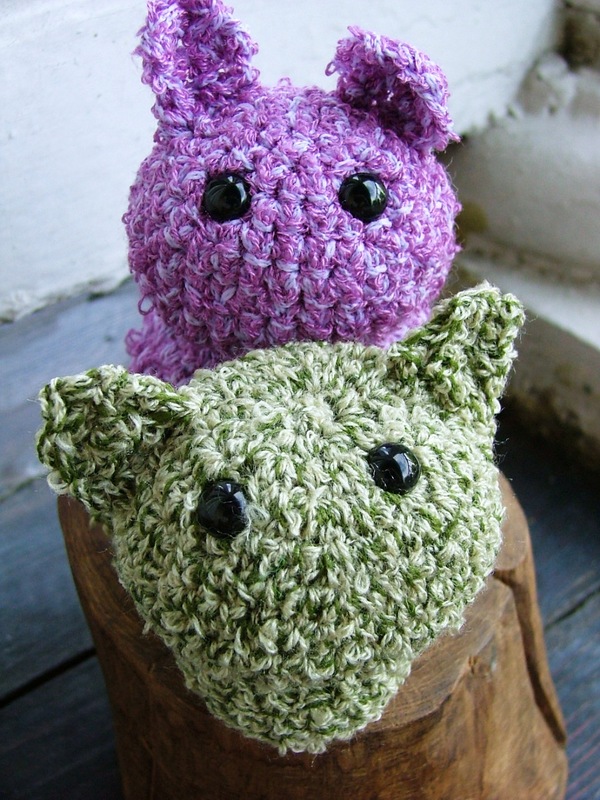 and yes, sell them in the etsy shop such a cute thing and people can buy t hem as presents for ones who love to craft and for themselves!! especially with those little tails!!! miss you, wish we could be on for tonight but none of the vonmarkos need this chunky cold mess!